I’ve been avoiding writing this post because I’m in the middle of a 3-week fitness challenge and I’ve got a freezer full of Baba’s griddle muffins waiting to be eaten. 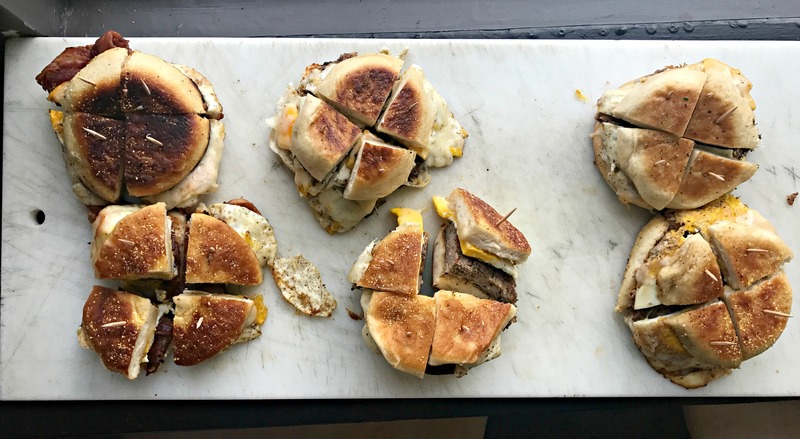 Please understand the extreme level of self-control I am exhibiting as I sit here editing photos of cinnamon rolls and piping hot muffin sandwiches oozing with cheese. The struggle is fo-freaking-real, y’all. Baba’s is a small, no-frills sort of place, open for breakfast and lunch six days a week (closed Mondays). Located at the corner of Hudson and Summit, in the SOHUD neighborhood (on the edge of Old North), Baba’s officially opened it’s doors in November 2016, after YEARS of effort by the husband and wife duo, Dan and Caroline Kraus. From food cart, to food truck, to being bamboozled by contractors–Baba’s came out swinging. Both the menu and dining area at Baba’s are small, but the sweeping open kitchen and prep space are indicative of their steadfast commitment to creating high-quality, locally sourced, every-dang-thing made-from-scratch food. Dan, a butcher by trade, says his love of food developed from the time he spent cooking with his Baba (Great Grandma) as a kid. He jokes that he was a pretty tough kid to watch, so his Baba put him to work in the kitchen. That griddle muffin I mentioned earlier is the starlet of Baba’s menu, and the base for their breakfast sandwiches, grilled cheese, and burgers. What’s a griddle muffin? Well, it’s sort of like a hot, pillowy, nook-less English muffin. Fluffy but squishy, in the best possible way. Baba’s breakfast muffins are a DELIGHT. Egg and havarti with your choice of meat or seasonal, locally sourced veggies. Available all dang day. If you bring friends with you, be sure to go splitsies on a cinnamon roll. They are yeasty and quite dense with icing so sweet your teeth will hurt. A perfect complement to some locally roasted Thunderkiss Coffee. The lunch menu starts at 11am and includes diner-style burgers, gooey PB&J, ham and cheese, inside out grilled cheese, plus fresh-cut fries. The fries, guys. THE FRIES. If you’ve never had a warm PB&J, you are missing out! At Baba’s they slather Krema Nut peanut butter and house made jam on what else but a hot griddle muffin. At a mere $3 this thing is a steal. As of July, Baba’s has only three employees (including Dan and Caroline)! This is quite impressive given practically everything on the menu is made in-house. They’ve got big hopes for future expansion, including branching out to BBQ. While it’s not on the menu every day, occasionally you’ll see special offerings like the smoked ribs pictured below. It sounds like Dan has dreams of one day opening a late-night food trailer in the parking lot. Given the location and close proximity to a plethora of grad students, this sounds like a great idea to me! Currently, you can grab a dozen local pasture-raised eggs from Grazing Acres at Baba’s for $5, and they are considering opening a local produce stand next summer. I’m already in love with Baba’s — I can’t wait to see the menus for their future pop up dinners. I cannot wait to go back! I have been telling everyone about Baba’s and how good everything on those griddle cakes are. So sad I missed out on this group trip, I guess that just means I get to go on my own and try everything! You totally need to go, and order everything that comes on a griddle muffin!